You can add new servers anytime from itopia Servers module and they will automatically be created in Google. 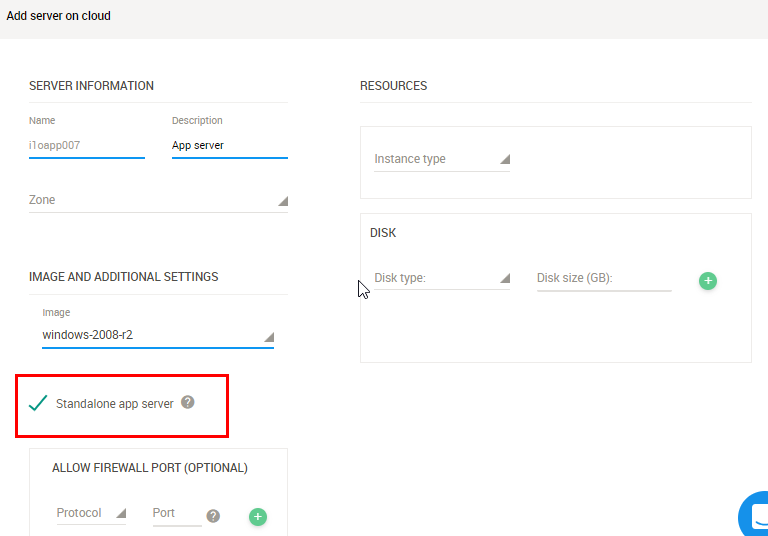 The option is designed for you to add your app server, SQL server or basically any other server that will not host users’ sessions. App server management from itopia platform is limited to starting/ stopping/ reboot/ resource management. You can also schedule server uptime and snapshots for them. To add new server, go to VM Instances module in CAS and click the green plus sign in the upper right corner. Below window appears to specify new server settings. The VM instance Name is generated automatically. Similar to other client's servers, the name starts with the 3 letter client code. In Description field, provide any description you find appropriate. You can select the Zone (Google datacenter location) where the server will be deployed. If the server needs to be part of your existing domain, you must select the same GCE zone as the one that's hosting the rest of your domain servers. In Image you can select the operating system. You can select any image regardless of your session servers configuration. There are several options including Linux and windows OS versions with pre-installed SQL. If you select Windows with SQL, Google manages both, Windows OS and SQL license for you and SQL license cost is added to your monthly bill. More information can be found here. 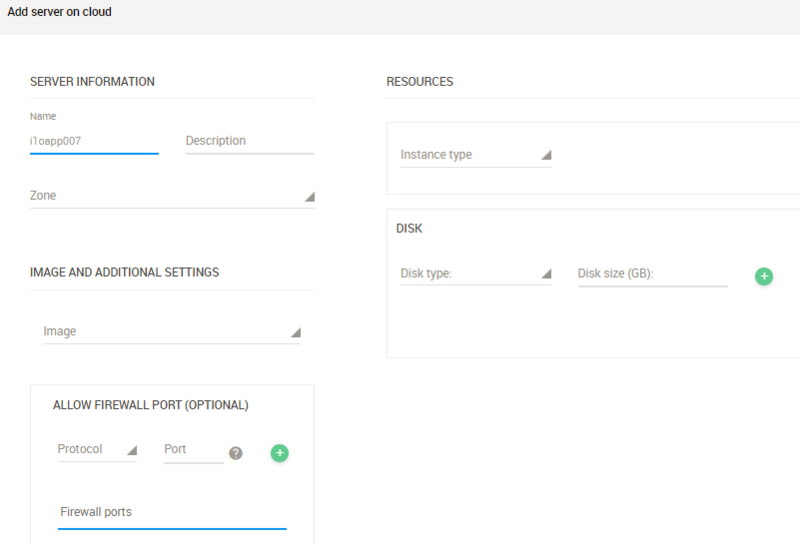 In Allow Firewall Port section you can specify ports to be open for the server. Port should be specified only in case external access to the server is needed. You can add as many ports as needed. In VM Instance type, choose from pre-defined RAM and CPU resources or specify your own clicking on Custom. Local SSD – is attached to local disk and data availability is depending on the server uptime. If you stop or delete your virtual VM instance, you will not be able to access your data. Per Google, Disk size minimum is 50 GB. Don't forget to click the + sign when finished editing the DISK section so the disk is added to your settings, otherwise it will not be saved. Hit Save and wait from 8 to 10 min for the server to be created. An automation will add it to your domain. IMPORTANT: If you make server changes directly in Google, you can affect the correct functionality of some features in itopia. If you create a server in a different GCE zone than the rest of your servers, it can only be created as Standalone app server. Such server cannot be reached from or added to your existing domain. The server will be reachable via the external IP. If you want to rdp using the internal IP, you will need to try creating a VPC network peer between the networks in order to allow the two networks to talk. Stand alone server refers to an VM instance that's configured outside of the domain. You have an option to create such server from VM Instances module. Start clicking the green plus sign in the top right. Server name gets populated automatically. Then proceed defining server Description and choose the image fro the server. After selecting the image, you will get an option to mark the server as "Standalone app server". Check it and proceed with the rest of the settings as you would normally adding any other server (steps above). You can select the Zone (Google datacenter location) where the server will be deployed. If you need to reach the server from your existing domain, you must select the same GCE zone as the one that's hosting the rest of your domain servers. Your domain admin credentials for this type of server will not work. You can connect directly form Google. Please follow this guide to learn more about creating a password for Google VM instances.